To know the ordered pair of a coordinate system let us recall the coordinate system. We represent a point in a plane by ordered pairs of real numbers called the Cartesian co-ordinates. To determine the position of a point in a plane we draw two mutually perpendicular straight lines XOX’ and YOY’. 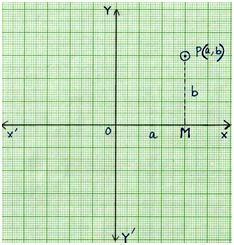 XOX’ is called the x-axis which is a horizontal line. YOY’ is called the y-axis which is a vertical line. Point O is called the origin. Whenever we write the co-ordinates of a point, first we write the x- co-ordinate, and then we write the y-co-ordinate. Suppose a and b is a pair of two numbers which is listed in a specific order then the co-ordinates (a, b) are called the ordered pair. Thus, in (a, b) we notice a is at the first place so it is known as x- co-ordinate and b at the second place so it is known as y- co-ordinate. So, we observe that (3, 5) and (5, 3) represent different points. So, we observe that (7, 2) and (2, 7) represent different points. The co-ordinate of the origin are (0, 0) i.e., its x co-ordinate is 0 and its y co-ordinate is also 0.